The teak species most common in North American woodworking projects is Indonesian or Burmese teak (Tectona grandis), although other, less-common species such as Bojonegoro teak and Philippine teak (Tectona philippinensis) are also available. All species are known for their high resistance to rot and are commonly used to make boat decks and railings and outdoor furniture. The teak tree grows to a height of 100 to 130 feet, and the trunk is from 3 to 5 feet in diameter. Most of the teak wood imported to North America is heartwood that comes from the middle of the trunk. Teak is a hardwood, but teak wood is softer than most domestic hardwoods and even some softwoods. Its Janka hardness rating is around 1,000, which is less than walnut, birch, ash, oak and even some species of pine and cypress. Far from being a disadvantage, teak's softness contributes to its workability. Considering that teak wood is so long lasting and attractive, it's no surprise that it's a favorite among woodworkers. Teak heartwood is golden- to medium-brown in color, and the grain is generally straight. The surface feels slightly greasy due to the presence of natural oils. A-grade teak is generally knot and blemish free. B and C grades are used primarily by builders and craftspeople in the countries in which the trees are harvested, and they aren't exported. Teak is a little too expensive to use for building ship hulls, but even if it wasn't, its natural oils are a barrier to epoxy adhesion. However, it's a good material for masts and rudders. Because of its superior rot resistance, teak wood finds its best uses outdoors. It's common for outdoor teak furniture to last for 70 years or more, even when exposed to rain and sun. Indoors, it lasts even longer. 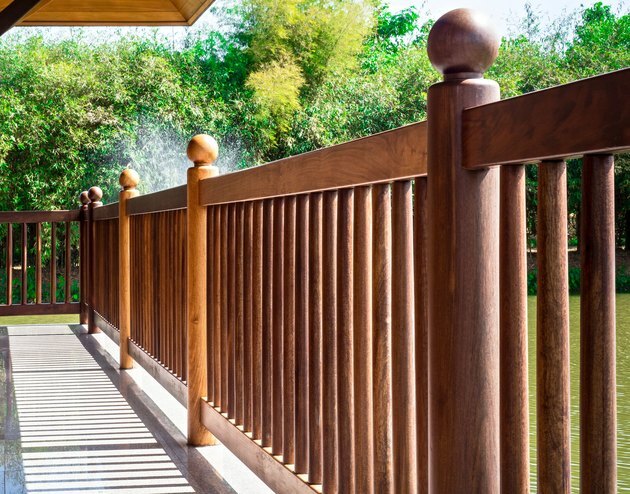 Outdoors, builders use teak to construct deck railings, but it's not an economical choice for decking. Most of the wooden furniture you buy for outdoor use is made from teak, and if you want to make your own furniture, teak is the best wood to use. It's easy to cut, although its high concentration of silica does wear down saw blades quickly. Indoors, teak is primarily a decorative material, albeit a somewhat pricey one. You can use it for flooring or woodwork features such as millwork or shelving. It's also a great material for countertops and cutting boards. Teak's natural oils prevent rot, so finishing is not a requirement. However, unfinished teak quickly turns gray when exposed to direct sun. You can preserve the natural colors by coating outdoor furniture and woodwork with spar or marine varnish, which deflects the ultraviolet radiation that breaks down the surface layer of wood and causes the discoloration. Conventional polyurethane varnish doesn't have these UV inhibitors and isn't as effective. Be sure to rinse thoroughly with clear water after scrubbing. Can I Use Decking Boards for Interior Flooring?